Recently, my friend and I took our ten-year-old daughters to San Francisco to see the San Francisco Ballet’s new production of Cinderella. We stayed at The Ritz-Carlton, San Francisco, which is right out of a fairy tale. Ideally located on the eastern slope of Nob Hill, the nine-story neo-classical building flanked with massive columns is a city landmark. It was originally the Met Life building when built in 1909 and has been transformed into a five-star hotel. If the sight of it weren’t enough, valets in top hats unloaded our luggage and parked our car. Once inside, the charming Guest Relations Coordinator, Andrew Cao, charmed our little girls when he welcomed them by their first names. Our little princesses made themselves comfortable in the lavish marble lobby where they enjoyed three different flavors of infused iced waters. It was Friday night, just before five when we arrived, yet there was no check-in line, which I wouldn’t have minded though because a friendly waiter served us moms champagne on a silver platter! We booked Club Level Deluxe Double Rooms. I had never stayed in the Club Level; now that I have, I may never go back! The Club Level is on the top two floors of the hotel so you need to use your room key to reach it. The elevators open onto a dining area where hors d’oeuvres were being set out for a five p.m. complimentary food presentation, something we were informed happens all day long on the Club Level – that’s right, breakfast, light snack, hors d’oeuvres and evening dessert, plus a full bar from 11 a.m. – 8 p.m. To our left, there was a grand sitting room with a table covered with cookie and candy jars for guests to feast on 24 hours a day. We were shown to our room where my daughter found a bounty of personalized gifts on her window-facing bed: a pink tutu, a tiara, a stuffed bear wearing a blue tutu, lollipops, chocolates and caramels, a toy cable-car – of course – a cone of kettle corn and some Ritz-Carlton animal crackers. And bottled water. Really?! Before she stopped squealing another butler arrived with a replica of the Golden Gate Bridge adorned with macarons (the fancy French kind), more chocolates and a white chocolate ballet picture. Prince Andrew Cao created these masterpieces for the girls and does so for all children who are guests. Did I mention our view? It was breathtaking: San Francisco Bay, Coit Tower and the Occidental Building. As if that weren’t enough, the beds were dressed in 400-thread-count, 100% combed cotton Frette linens, down comforters and duvets. For our entertainment, there was a 32-inch HD flat-screen TV, DVD player and iPod dock; for our comfort, plush terry robes and slippers were waiting in the closet. The room, which was over 400 square feet, was a stocked honor bar (superfluous really with the open bar down the hall!) coffee and tea maker, an ironing board, desk, reading chair and ottoman and – Tess’ favorite – matching sinks in the marble bath and an illuminated 5X vanity mirror. The Ritz-Carlton, San Francisco takes posh family travel to a new level. If you are vacationing with a child under the age of 5 – or one who likes to stick things in light sockets – they offer the Protect Our Little Ones (POLO) program. These families are escorted to their room by a specially-trained bellman who installs safety features including a night light, a tub spout cover, electric outlet plugs, first aid kit (children’s Tylenol, Band-Aids, thermometer, diaper rash ointment), emergency safety card with list of local emergency telephone numbers and of course, a stuffed animal. If you’re traveling with a nanny, the hotel will provide you with a “Nanny Survival Kit,” which includes a sightseeing map of San Francisco, a of “Family Activities,” a San Francisco WHERE Magazine, sunblock, Ritz-Carlton bottled water, Band-Aids and cookies delivered to the guestroom upon arrival. The concierge can help arrange a babysitter, too. As soon as we were settled in, it was time for the evening hors d’oeuvre service, which included oysters on the half shell, an array of delicious cheeses and tapas-sized servings of delicacies like salmon and duck. Needless to say, while Tess and her friend Chloe frolicked in their tutus, Mom indulged in a perfectly shaken extra dry Hendrick’s martini. I enjoyed the rain showerhead and the Asprey bath amenities when I got ready for our night on the town. We dined in The Lounge, the more casual of the hotel’s two restaurants. It’s right off the lobby, beautifully decorated with eclectic plush furniture and a roaring fire. We sat by a window overlooking the San Francisco skyline; the clang of passing cable cars accompanied our meal. Tess ordered her favorite – fried calamari, and her pal Chloe had the kid’s menu pasta. The moms shared a burger and fries with a side of kimchi, salmon flatbread and a traditional Caesar salad. Everything there is made with local ingredients – even the catsup was homemade. it’s San Francisco after all – and everything was delicious. The hotel’s other restaurant, Parallel 37, is also on the lobby level. It is named for the geographic latitude that runs near the San Francisco Bay Area. It’s elegant and chic, with a globally-influenced menu where culinary artistry and hyper-seasonal and local – from parallel 37 – ingredients are the focus. Chef Michael Rotondo’s market-driven dishes are refined, creative, interactive and fun, consisting of several small portions. If we had stayed another night, I would have opted for Chef Rotondo’s eight-course tasting menu. I also would have enjoyed the lively bar and lounge where hand-crafted specialty cocktails are served. Kids will be happy there too, since even at this high-end restaurant for sophisticated tastes, they offer a kids’ menu. There is also 24-hour in-room dining with a seasonal menu – one for kids, too. The Ritz-Carlton San Francisco is in a fantastic central location, close enough to the Opera House that we were chauffeured to the ballet in the complimentary Ritz-Carlton house car. The driver – Salvadore Rodriguez – gave us his cell number so we could text him during the curtain calls. Moments after we stepped outside – the ballet was stunning, btw – Sal whisked us back to the hotel before we turned into pumpkins. We slept like princesses on those plush beds, sans peas! San Francisco is its own playground. There is so much to do that you’ll wish you had more time to spend in this incredible hotel. There’s Alcatraz Island, the new Exploratorium, the Embarcadero, the Aquarium, the Ferry Building and more. You can even hop on a cable car right outside the hotel. After a lovely and very relaxed breakfast in the Club Lounge, which included a cappuccino/latte/espresso/hot chocolate machine that I would like installed in my kitchen ASAP, we took a taxi to Misson Dolores, which is listed in the hotel’s “Where to go when you’re in San Francisco” dossier for kids. Completed in 1791, it is the oldest building in San Francisco and survived three major earthquakes. We were blessed with a sunny day to enjoy the ancient cemetery and surrounding Mission neighborhood. From there we headed down to the Ferry Building Marketplace where the Farmer’s Market was in full swing. Another taxi took us to Fisherman’s Wharf, which boasts more than 100 tourist shops as well as a carousel, bumper cars and other rides. The best part of the pier is the colony of California sea lions that bask in the sun at the West Marina. There were easily over a hundred out that day, barking and smiling and rolling around. It’s really wonderful. Our biggest regret was that we couldn’t spend another day and night at least. There is so much to do and see in San Francisco and there was so much more to do at The Ritz-Carlton, San Francisco! Spa~De~Vie at the hotel is on the first floor, three floors below the lobby and next to the complimentary and very well equipped fitness center where you can hire a private trainer. The spa offers a full menu of services including massages, facials and body treatments and his and her steam rooms. The fitness center has an army of cardio and strengthening machines as well as a room for yoga and stretching with an assortment of exercise balls perfect for rolling out an airplane-knotted back. I can’t recommend the Club Level enough. It’s like staying in a staffed mansion. The all-day food offerings are so perfect with little ones because they’re all included. You don’t have to stress about getting charged a fortune every time you need a snack. I felt comfortable letting the 10-year-olds venture to the Club Lounge at snack time – it’s very safe and contained. The convenience is unparalleled. When it was time for us to depart, the 24-hour Club concierge printed our boarding passes. If we had needed one, they could have rented us a car or hired us a taxi; they would have pressed our clothes and provided a computer, cell phone or even iPod all in several languages. They made us feel like we were at the King’s Ball! The Ritz Carlton, San Francisco is the ultimate in luxury family travel -- we can't wait to return! 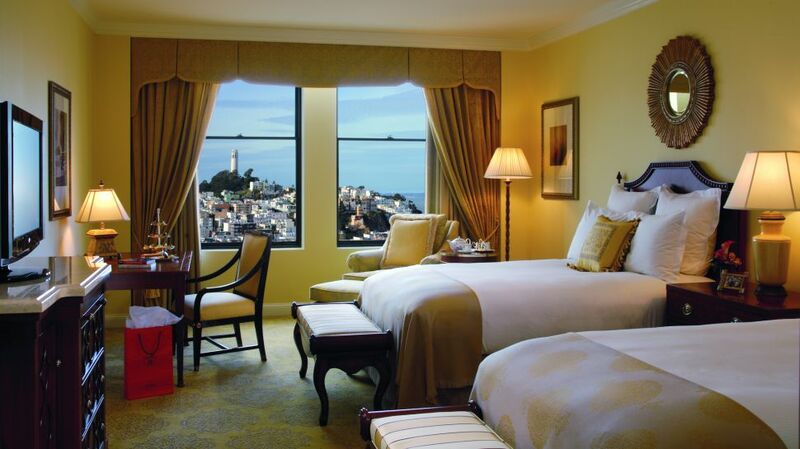 Room rates at The Ritz Carlton San Francisco begin around $440 a night. Poshbrood/SmartFlyer is a member of Ritz Star's program. Clients who book through Poshbrood can receive additional amenities such as room upgrade upon arrival, daily breakfast for two, VIP status, welcome amenity, late check out and a food and beverage credit. Email us at travel@poshbrood.com! Have an upcoming trip to San Francisco? Consider the "Treat You Package" starting at $565 USD per night. Relax and enjoy a four night stay on The Ritz-Carlton Club® Level and receive one complimentary night. Offer is valid through December 31, 2013 and subject to availability. Rate is per room/per night, based on single or double occupancy, exclusive of taxes, gratuities, fees and other charges; does not apply to groups; cannot be combined with any other offer and is not applicable for Rewards redemption. Advance reservations are required. No refund or credit for unused portion. Void where prohibited.